Saffron is a highly prized spice used for seasoning and flavouring, especially in Indian and Middle Eastern food. The delicate stigmas (or threads) are plucked from the saffron crocus and dried before use. Due to this intensive process to harvest just a few stigmas and the fact that it grows in only a few countries around the world, the cost of saffron is very high. So high, in fact, that the question “what spice is more expensive than gold?” has become a staple of nearly everyone who has leaned against a bar with a beer. Saffron users are also going to need quite a bit of storage space to match its “weight in gold”. With a standard gold bar, as used by the bullion traders and banks, weighing 12.4kg you’re going to need a whopping 24,800 of these 0.5g packs that are sold by Tesco supermarket (at £2.50 each that would set you back £62,000)*. But you’re certainly not going to need anything like that to spice up your food. Just a couple of strands is enough to add a beautiful flavour and aroma to your pilau rices, biryanis and kormas. The best way to use saffron is to put a couple of strands in a small amount of warm water or milk and press gently with the back of a spoon. This will release all the wonders of the spice, which can then be added to your dish. The high cost of saffron means it is unlikely to be used in many restaurants. They will instead use the cheaper safflower, turmeric or colouring agents to try to mimic the properties of saffron. Saffron is also know as zaffron or kesar (Hindi) and the largest producer of it is Iran, followed by Greece (where it was first cultivated), Morocco and Kashmir. Saffron has also been used for medicinal purposes and as a dye for clothes, its stigmas creating a colour which would have conferred status on the wearer due to its high cost. * At 10 January 2019. The poor old Korma gets a bit of a bad press in Britain. The obsession among some people in eating ever hotter curries means the Korma gets lumped with the “curry novices” tag because it is mild and creamy. And to be fair, the quick and easy Kormas some restaurants turn out have hardly done anything to raise its status. The pale dish that most diners are familiar with uses very little spice – garam masala and perhaps a little turmeric – which is mixed with puréed onions, garlic, cream, cream coconut and ground almonds. And, yet, a well-cooked Korma can be one of the tastiest dishes on a menu – it was certainly highly regarded by the courts of the Moghuls and is said to have been served at the inauguration of the Taj Mahal. Korma actually refers to a style of cooking where the chef starts by frying ingredients with oil and avoids using adding water until towards the end of the process. The water must be fully evaporated by the end of the cooking. As such there is no reason why a Kormas has to be mild at all – and indeed there are many Kormas which use chillies. The Spice Card offers savings on curries, including on takeaways at many venues. You can get your Spice Card here. For a really rich, vibrant colour in your Kormas use saffron (not turmeric). To extract the colour from the saffron put a few strands of it in warm milk and gently press with the back of a spoon. The same trick works to give a beautiful colour to your Biryanis too. For a really rich, vibrant colour in your Kormas use saffron (not turmeric). To extract the colour from the saffron put a few strands of it in warm milk and gently press with the back of a spoon. It’s all about the lights. You can see them as you drive past Zin Zeera in the evening and they look great. I’m sure that they’ve picked up a lot of business by people drawn in by the light show, but it’s only good food and service that will keep them coming back and at least on one count, they have a chance. Zin Zeera opened last year on the old Bottoms Up site in Hellesdon. The opening night was by all accounts a bit of a disaster with cold food and big delays causing some diners to walk out. We went as a party of eight (including four children) on a Saturday night and apart from the lights, the first thing you notice is that it’s massive. The dining area is huge and although it is very impressively finished, all sparkly floors and chrome; cosy it is not. This will be their biggest challenge: filling the place. We arrived at 7 and by 8.30, prime time for curry eating, the restaurant was at best a third full. Because of the size they have employed lots of staff; in fact they have a girl whose entire job was to hold the door open for people arriving and leaving. Bizarrely though, service was slow and inattentive. The waiter taking our order appeared totally distracted and kept looking back over his shoulder at the bar staff. No surprise that two dishes were missed from our order completely. However, when the food did arrive, it was excellent. We had ordered a wide range of dishes from Korma (chicken £5.95, king prawn £9.95), through Bhuna (meat £6.45) and Dhansak (chicken £5.95) to Vindaloo (meat £6.45). My Dhansak was the best I’ve had – rich, full of flavour and not floating in a pool of oil like some I’ve had. The rest of the party also enjoyed their dishes. Once the staff had finally noticed we had finished, egged on by my fellow diners, I even broke the cardinal rule and ordered a dessert! I didn’t believe they actually existed, I thought the whole dessert thing was just a game where you looked at a plastic menu full of frozen stuff before saying no and sticking a hot towel on your face. The bill came to £150 for eight which included plenty of drinks so value was good and we were even given a discount card for 10 per cent off future bills and 20 per cent off takeaways. So in all, it was a thumbs up for Zin Zeera. If they can improve their service and find some way to fill the place so it creates a better atmosphere, they will survive. They may even make enough of a profit to pay the light bill. Zin Zeera, 2 Boundary Road, Norwich, NR6 5LA. Tel: 01603 408888. Open: daily noon-2.30pm, 5.30pm-11.30pm. Let me tell you, turnip tastes good curried. Sliced and cooked in a Jalfriezi-style with turmeric, onions and green peppers, it’s time to take a bow Empress of India chef. And taking a bow for food at the end of a buffet shift takes some doing. Buffet food never usually scores, let’s be honest, but it works for me if it’s Indian and I have plenty of time to try ‘just a little bit’ of everything. Getting there with ten minutes to spare, ain’t so good. You could argue the food should be as good at the end as it is at the start or you could argue getting there late is my own silly fault. I blame the long King Road (in all its East, West, South and North guises) that links Kitchener and Waterloo, which meant me getting off the bus way past the Empress and heading into a bar (purely for directions you’ll understand). Ten minutes before buffet closing means dried-out looking food, no restocking and almost no desserts left, and curry in a hurry. So it’s to the chef’s credit the food was still pretty decent. Following on from the turnip was a tasty Chicken Korma, even though it was actually a Chicken Curry (the waitress admitted ‘this is supposed to be a korma’) and good, moist pillau rice. And even though time was pushed there was still enough for nicely marinated Chicken Tandoori thighs, a crunchy Vegetable Curry, curried chick peas and slices of nan to mop it all up. Only the bony Lamb Curry didn’t appeal. Good work chef. The lunchtime buffet (Mon-Fri) comes in at $11.99, but by time you’ve added a Kingfisher ($4.85), taxes and tip that’s flown over $20. 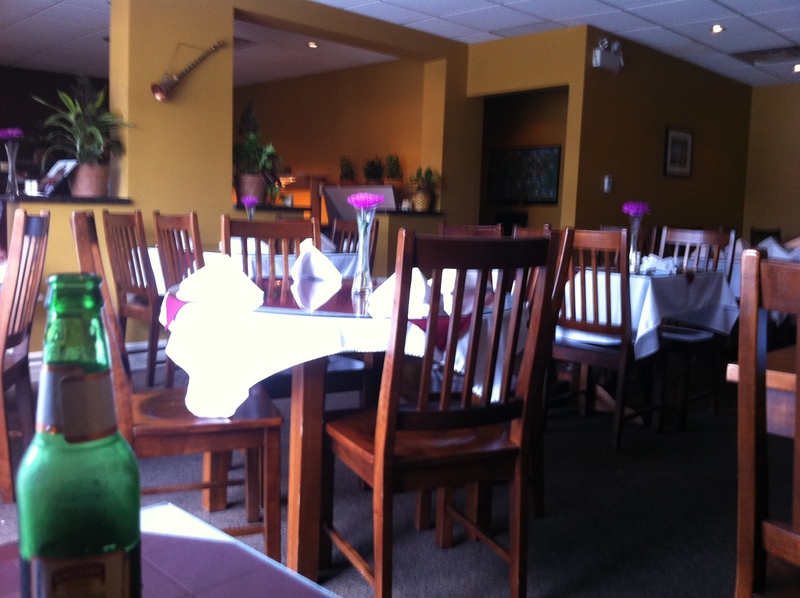 Empress of India, 103 King Street North, Waterloo, Ontario, N2J 2X5, Canada. Tel: +1 519 883 1314. Open: Mon-Sat 11.30am-2pm and 5pm -10pm (10.30pm Fri-Sat), Sun 4pm-9pm. * Now moved to 34 King Street South.